Martin Sheen. Larry Fishburne. Marlon Brando. Robert Duvall. Dennis Hopper. Frederic Forrest. Sam Bottoms. Scott Glenn. Harrison Ford. War. Cannes Palme d'Or Winner. Vietnam War. Drugs Related. Critics' Top 100. 01 Nigel's Choice. 01 Dave B's must sees. Dave T's Platinum Picks. Drama. 01 Adam's Faves. 01 Ade tastics. Peoples' Choice. Sea/Rivers/Boats/etc. 01 Kelly's Heroes. Rob Recommends. Surfing. Literary Classics. Jungle. Madness and Mental Illness. Action/Adventure. Guardian 1000 Must See (2007). Recommended. The definitive 'Apocalypse Now' (as if the original wasn't pretty definitive) this has nearly an hour of extra footage fleshing out the surreal journey of our central protagonists and, though it brings the film to a whisker short of three and a half hours, much of it explains what happens to the eclectic characters we meet. 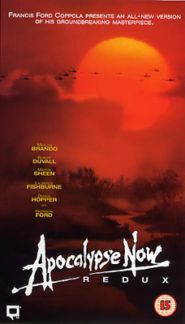 The cut version of 'Apocalypse Now' stands as one of the most awesome films of modern cinema, anyone who has seen it will inevitably see it again, it's just that now you have the opportunity to see this. For disciples...enjoy, for the uninitiated...it's time to for a sublime head &*%. Ooohps, see film number '101' to find out what the films actually about!